To coincide with celebrations in Britain marking the 25th year of Queen Elizabeth II's reign, Meriden hit on the idea of a special edition of the Bonneville. It's distinctive trim featured silver, as well as patriotic red, white and blue. Originally it was announced that the Triumph Jubilee Bonneville would be made in a limited edition of 1000 and the first batch side panel badges bore the legend "One of a Thousand". However, demand for the machine was sufficient to persuade the Cooperative to release a further 1000 T140 J's with the wording altered to read "Limited Edition". A further batch, generally agreed to have been about 400 machines, were produced for the International market, being Canada, Australia and New Zealand. The Jubilee appealed to collectors who wanted a machine as much for ornament as for riding, or as a sentimental souvenir of a British motorcycle industry which in 1977 looked set for extinction. As a result, a high proportion of T140J's have remained in totally original condition. Engine numbers on the Jubilee followed the same sequence as standard T140V models but with a J suffix instead of the V. For 1977 engine numbers began at GP 75000.All the Jubilee's variations from standard were cosmetic. All outer engine cases, primary drive cover, gearbox outer cover and timing cover were finished in bright chromium plate, applied on the aluminum alloy. The Jubilee introduced "upside-down" gas shock absorbers fitted with their pre-load adjusters uppermost. Like the standard oil-damped units, they featured chrome springs. Probably wisely, the factory opted not to change the black enameled finish of the Jubilee's frame and swinging arm. The wheels on the Jubilee were clearly different in terms of finish. Instead of being in plain chrome, each wheel rim had a blue central band with white inner and red outer pin striping, painted over the plating. The Jubilee's original tyres were a Dunlop K91, 4.10 x 19in at the front and a 4.10 x 18in at the rear, with red lining and directional arrows on the sidewalls. The Jubilee's seat was the first of a design which would ( apart from the special color's) become standard on all Bonneville’s for the following year. The familiar aeration on the seat top had gone, replaced by a narrower crosshatched panel. On the jubilee the panel was covered in blue vinyl along with the rest of the seat. Red piping ran round the top perimeter of the rear portion before running downwards along the sides and looping back up towards the front of the seat. 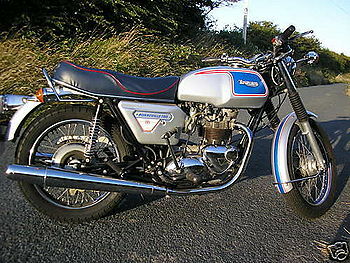 The lower rubber trim was blue with the decorative chrome stripe, the Triumph logo was displayed in silver as were the words " Silver Jubilee " on the back of the unit. Mudguards were painted rather than chromed on the Jubilee Bonnevilles and followed the scheme of the wheel rims. A center stripe of blue flanked by white inner and red outer pin striping was applied over a base coat of silver. Jubilee fuel tanks were the same as those specified for their respective market on the standard model, except for color. While graphics retained the same layout, the blue and silver theme continued. A blue side panel was applied over a silver base in the U.K. while the U.S. version sported blue flashes - curved back in the usual fashion from the top of the tank badges - over a silver base. In all markets, the pin striping was in white and red, with the red sandwiched between two white lines. The side panels were all new, like the seat and rear shocks, but with changes to finish were destined to become standard items on all Bonneville models. They fitted over the existing panels and were plain silver with a special extended badge. The top of the badge was similar to the existing " Bonneville " badges, but there was a triangular extension underneath the Bonneville name at the rear. This enclosed a Union Jack in the center flanked by the words " Silver Jubilee " and with either " One of a Thousand ", " Limited Edition " or " Limited International edition " underneath. The panels themselves featured a new mounting system with a single screw just below the badge, backed up by a concealed spring attached to a metal lined eyelet on the inside of each panel, running over the top of the carburetor's and pulling the two panels together. On the chain guard, the Jubilee theme continued in silver with a blue styling stripe along the upper part about 1/2 in from the top edge, tapering down to a point just before the rear end of the guard, the stripe was double lined in white and red. The only other detail of finish to mark the Jubilee apart, was it's chrome plated rear light housing, now painted black on standard models. This page was last edited on 21 January 2011, at 16:58.